Autotune for Power Vision is a built-in feature inside the device itself that is free of charge. Autotune gives you the capability to perform closed-loop tuning of the Power Vision so you can further enhance your motorcycle’s calibration. Power Vision is a ECM flash tuning device, so the adjustments are calculated real-time in the Power Vision, this allows you to review the changes and either accept or ignore them, before flashing the updated tune to the bike’s ECM. There are two versions of Autotune for the Power Vision – Basic and Pro. Autotune Basic: This is included for FREE with the Power Vision. It utilizes the stock narrow-band oxygen sensors that come equipped on the motorcycle*. With a few simple clicks of the Power Vision’s touch-screen, you can perform real-time data-logging and calibration to your Power Vision. Works with all 2001-2016 models equipped with factory oxygen sensors. Autotune Pro: Requires the purchase of the Autotune Pro accessory kit. It includes a control module, two wide-band oxygen sensors, cables, and everything needed for installation. What is Autotune, a product or a process? 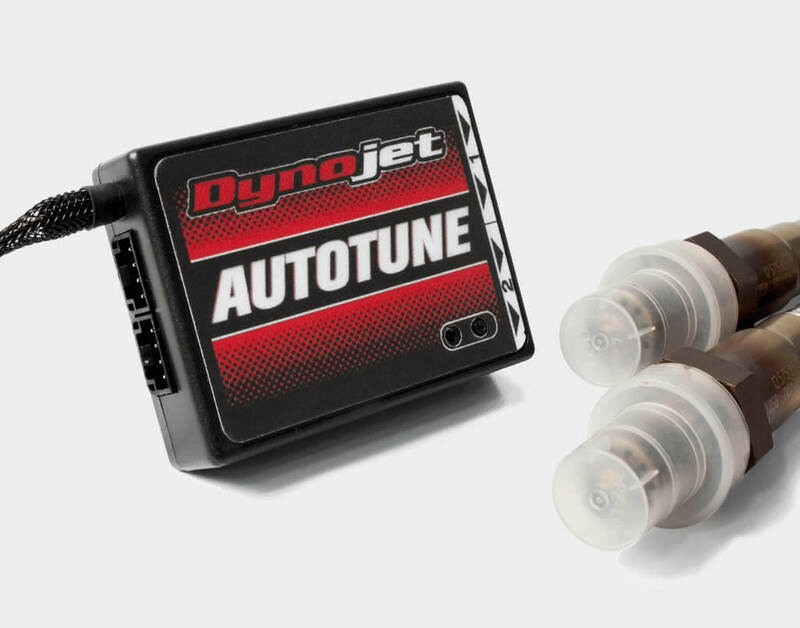 At Dynojet we throw around the term Autotune quite frequently, so let us do our best at explaining what it is, and what it does. This product overview is intended to cover the basics, and is by no means a comprehensive guide to EFI tuning, systems, or best practices. A little EFI 101 may be beneficial to lay the ground work and better your understanding of all that’s going on in this sometimes confusing world of EFI tuning. In the world of electronic engine management / EFI, most modern systems employ closed loop feedback for fuel control. These systems are often based around narrowband O2 sensors that provide feedback to the ECM in regards to how rich or lean the vehicle is running. The ECM uses it’s calibration (tune) to determine if it should maintain closed loop fuel control, and also references a target Air-to-Fuel Ratio (herein AFR) value during certain conditions (load vs. rpm). If there’s error between what the ECM is asking for and what the OEM narrowband sensor measures, then a correction is made to adjust the lean or rich condition. This sounds great, and it is, but here’s the catch... narrowband sensors are ONLY accurate at, or near, the stoichiometric value of the fuel being used, which is 14.7:1 for gasoline. This value is where complete combustion would occur, if it could occur, and is where you would achieve the best fuel efficiency. This value, however, is NOT ideal for all operating conditions of a Harley-Davidson motorcycle, or any engine for that matter. Achieving a balance of fuel economy and best power / torque is the goal, and we’ve developed some handy tools to take the mystery out of tuning a fuel injected H-D motorcycle. A typical Harley-Davidson ECM calibration has areas of closed loop and open loop. In other words, there are areas where it can “see” the AFR and other areas where it can not. When you’re in a range that requires precise measurement, but is outside the reliable window of a narrowband sensors operation (considered 14.3 -15.2 AFR), then a tuner / EFI specialist must rely on wideband O2 sensor data. Since the ECM does not typically use or support wideband O2 sensors, a tuner must monitor / log the AFR values generated from a wideband O2 controller (like Dynojets’ Autotune wideband O2 sensor control module). The wideband O2 sensor values provide tuners or electronic tuning devices with data with which to make decisions on how they’ll address fueling in the open loop regions of the tune (those regions where the ECM has no idea what the AFR really is). In either case, if the target AFR from the calibration is NOT achieved, the error must fixed by measurements acquired from the stock O2 sensors or aftermarket wideband sensors. In the case of a Harley engine management system, we fix the error by adjusting the VE (volumetric efficiency tables). 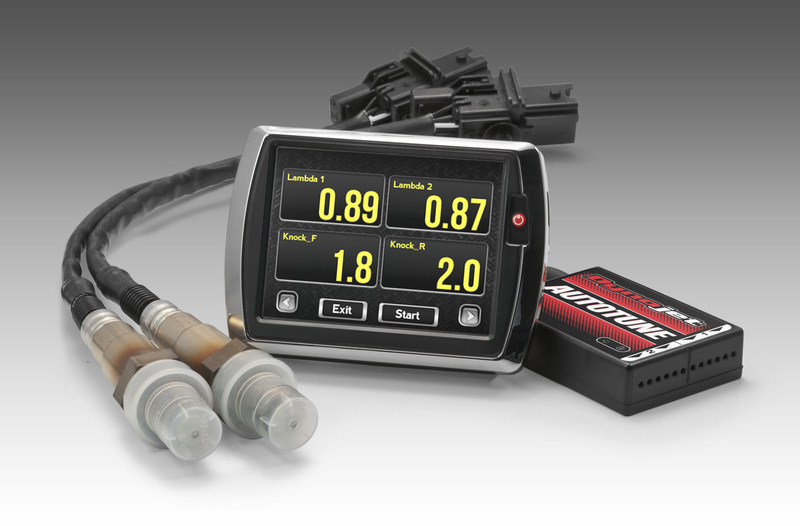 Question: What does Dynojet offer to help me tune my bike? The Power Vision can provide meaningful tuning feedback from EITHER the OEM narrowband O2 sensors AND / OR from the Autotune module’s wideband O2 sensors……we call this Autotune Basic or Pro respectively. So, with Autotune Basic and without any additional modules (it’s simply a process) you could use the Power Vision to take advantage of what the ECM “sees” from its OEM narrowband O2 sensors and help it achieve the target AFR. Not only can it fix the normal closed loop range, but the Autotune Basic will actually temporarily extend the closed loop range to gain insight on the actual AFR in areas where it’s normally not allowed (high load / high rpm). For the record >> At high load, high RPM ranges this “temporary situation” is not ideal, and this is where it’s advantageous to use Autotune Pro. We offer Autotune Basic because essentially it’s free for the user, and it’s offered by the competition (V-Tune / Smart Tune ) as a band-aid approach to professional tuning. This method works great in those areas where it makes sense to run in a lean state: idle, light load, and cruise conditions. So, in any case, now the Power Vision can “see” what the ECM is commanding for AFR AND it can see what the actual AFR is in the exhaust. Armed with this information and other data from the H-D OEM databus, the Power Vision can automatically fix the deviation between the target AFR and actual AFR by adjusting the VE tables. The data is learned in real time, but processing the data and adjusting the tune is done in an “offline state” (key on / engine off). In the end, the Power Vision can process the data, correct the tune, and then reflash the corrected tune into the ECM. If you want to tune like a pro and get serious about developing a safe, efficient, and powerful tune, then you need Autotune Pro. 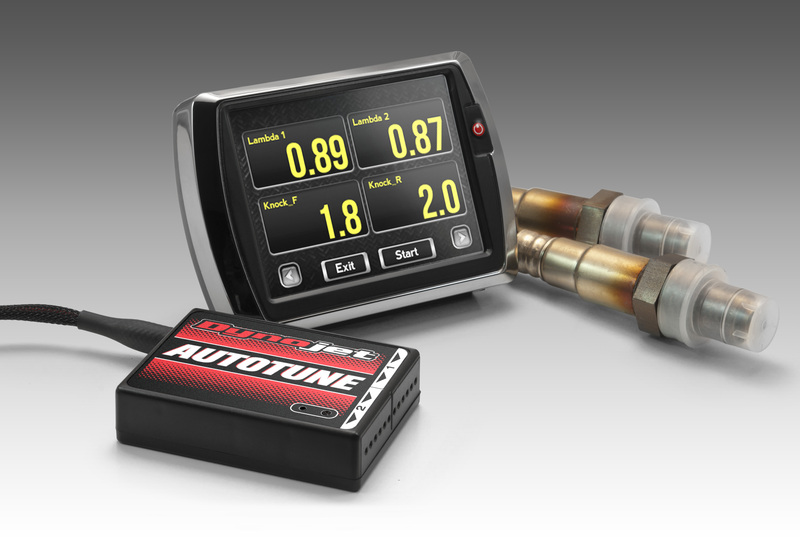 I’ll start by making this statement, “Any aftermarket EFI tuning system that does NOT use wideband O2 sensors inherently can NOT give you real time, valuable insight as to how rich or lean the bike is running in areas outside of the OEM closed loop range.” Autotune Pro is a process AND requires a product; that being the Autotune wideband control module. The Autotune module uses wideband O2 sensors in order to measure the actual AFR in the exhaust, and these sensors can accurately sample AFR values from 10.0:1 to 18.0:1 (remember, narrowband O2 sensors are only accurate from 14.3 – 15.2 AFR). When the Autotune module wideband O2 sensors are installed in the exhaust and you’ve selected Autotune Pro in the Power Vision, you’re on your way to a complete, refined, and powerful tune. The Power Vision, when running in Autotune Pro mode, will actually temporarily set up your tune just like a professional tuner and datalog all required channels WITHOUT using a computer. Just like Autotune Basic, the entire process is attempting to correct the error from what’s commanded in the ECM defined as the target AFR, and the AFR that’s actually measured in the exhaust. Armed with this information and other data from the H-D OEM databus, the Power Vision can fix the deviation between the target AFR and actual AFR by adjusting the VE tables. The data is learned in real time, but processing the data and adjusting the tune is done in an “offline state” (key on / engine off). Neither Autotune Basic nor Autotune Pro require that you interface with a computer when using this feature. Power Vision sets up the tune, monitors and logs the data, and then corrects the tune to ensure what you ask for (in the AFR table) is what you get. You essentially have a full time professional tuner inside your Power Vision with the Autotune feature. So, how do you know if your bike can be fitted with an Autotune wideband O2 controller and the included 18mm wideband O2 sensors that are required for the Autotune Pro feature? On bikes that had factory closed loop fuel control / 18mm narrowband O2 sensors, you can simply remove them and install the 18mm wideband O2 sensors. This requires that you temporarily (or permanently) disable closed loop……..or…..if you wanted to retain the OEM narrowband O2 sensors / closed loop fuel control AND install the wideband O2 sensors then they’d have to weld in bungs to their exhaust to accommodate the wideband O2 sensors. If the bike has factory 12mm O2 sensors, and the guy wants to retain his stock exhaust, then there is no choice but to have 18mm O2 bungs welded into the exhaust. On bikes with OEM 12mm narrowband O2 sensors, you could remove them and opt for an aftermarket exhaust that had 18mm O2 sensor bungs. This will require that you disable closed loop. If you wanted to retain the OEM narrowband 12mm O2 sensors / closed loop fuel control AND install the wideband 18mm O2 sensors, then you should look for aftermarket pipes that retain the factory 12mm O2 sensors AND had provisions for the wideband 18mm O2 sensors. Note >> In 2010 Harley introduced the small 12mm O2 narrowband sensor on the Touring Models, and that has continued to be the case through the current model year for the Touring Model. In 2012, Harley decided to use the small 12mm narrowband O2 sensors on Dyna, Softail, and V-rod as well. Sportsters continue to use larger 18mm narrowband O2 sensors. Note >> Not all aftermarket Exhaust systems have the needed 18mm bungs, it is best to check with the manufacture of the exhaust system.